If the end of the year is a time for reflection, don’t underestimate the power of a well-placed mirror to enhance your home in the new year. 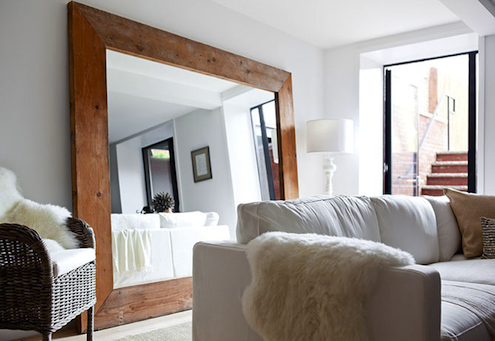 Mirrors do their best work in tight spaces; a wall-sized mirror can increase the feeling of space enormously. Even a small one in a windowless half-bath can do almost as much good as a window. In a small bedroom, mirror the recessed panels of a closet door and watch the space grow. Any good view in your home is worth doubling. Hang a mirror on the wall opposite or at right angles with a window with a view of the garden or your favorite painting. A mirror at the back of a china cabinet or over a buffet lights up dark corners and plays up the sparkle of the things that are important to you. The right mirror placement isn’t always obvious, sometimes the view from above the fireplace mantle isn’t as good as the view of the fireplace mantle. Place your mirror where it shows your home’s best side.